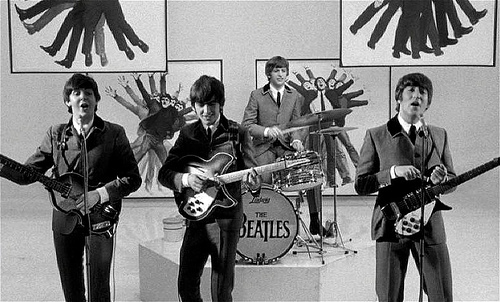 From the opening shot of the Fab 4 being chased down the street by screaming teenyboppers to the final clanging guitar notes of the title tune, A HARD DAY’S NIGHT makes a joyful noise introducing The Beatles to the silver screen. 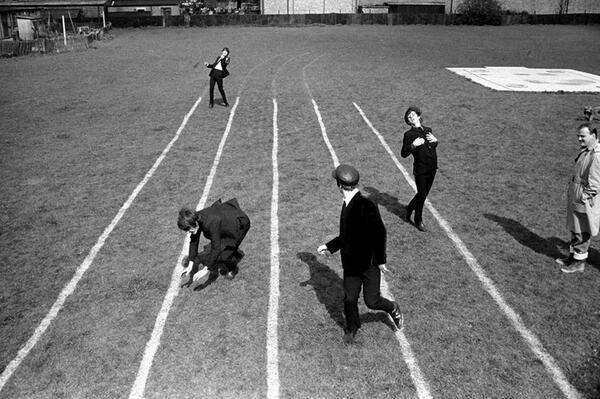 John, Paul, George, and Ringo come off as a mod version of the Marx Brothers with their anarchic antics, guided by the deft hand of director Richard Lester. Shot in cinema verite style, this zany, practically plotless romp follows the boys as they head to London for a live television performance. Accompanying the Beatles is Paul’s grandfather, an old codger who’s “nursing a broken heart”. But don’t let Foxy Grampa fool you, for as Paul says “He’s a mixer”, a troublemaking curmudgeon who’s always stirring the pot. Grandfather’s a bit of a lecher too, and is constantly getting in trouble. 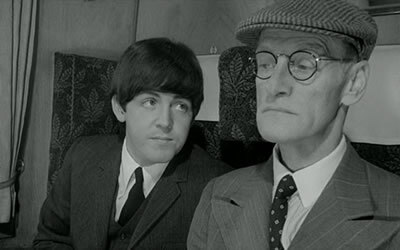 He’s played by Irish actor Wilfrid Brambell, known to audiences across the pond as the incorrigible old junkman on the popular sitcom STEPTOE AND SON. References throughout the film to Grandfather as being “very clean” are in contrast to his “dirty old man” sitcom character. The series was later Americanized as SANFORD AND SON, starring another “dirty old man”, Redd Foxx. Q: How did you find America? John: Turned left at Greenland. Q: Are you a Mod or a Rocker? 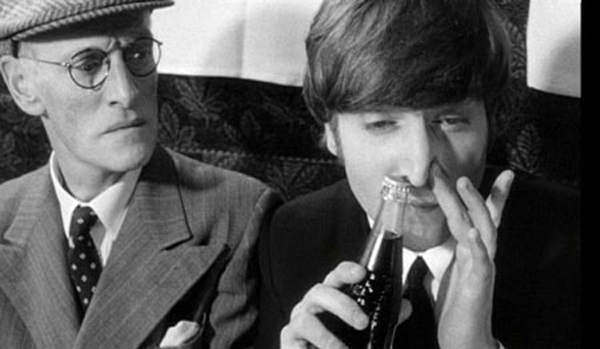 Ringo: Neither, I’m a Mocker. Q: What would you call that hairstyle you’re wearing? George: Arthur. But it’s the music Beatles fans will treasure, as they perform twelve of their hits, beginning with “A Hard Day’s Night”, then “I Should Have Known Better”, “I Wanna Be Your Man”, “Don’t Bother Me”, “All My Loving”, “If I Fell”, “Can’t Buy Me Love”, “And I Love Her”, “I’m Happy Just to Dance With You”, “Tell Me Why”, and “She Loves You”. An instrumental version of “This Boy (Ringo’s Theme)” is heard during Ringo’s trek through London, with all incidental music by Beatles producer George Martin. 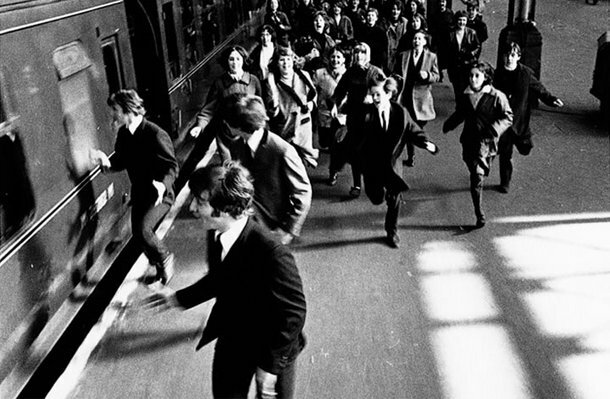 American ex-pat Richard Lester directed the controlled chaos so perfectly he was assigned the Beatles second film, HELP! Lester’s madcap style served him well in mod 60’s films like HOW I WON THE WAR (starring Lennon), A FUNNY THING HAPPENED ON THE WAY TO THE FORUM, and PETULIA, and into the 70’s with THE THREE MUSKETEERS and its sequel, and 1980’s SUPERMAN II. John Jympson’s frenetic editing contributes to the freewheeling pace, and Alun Owen’s screenplay provides a good framework for the lunacy that ensues. 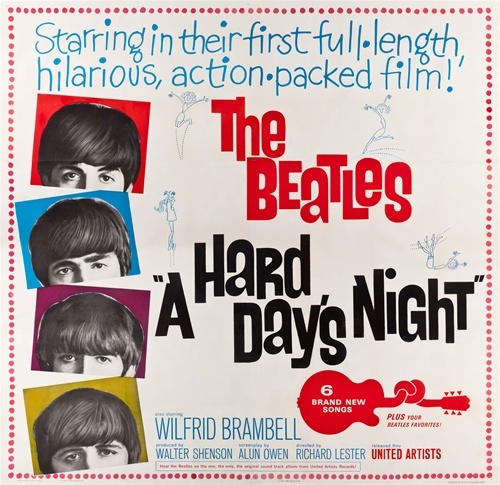 One of the all-time great rock films, A HARD DAY’S NIGHT is a rollicking romp through early Beatlemania, and if you’re too young to remember what the fuss was all about, see this movie! There’s a lot going on in this movie, you’ve got to watch carefully, too! I haven’t watched this in years. I never got into the Beatles, the later stuff a bit. The only thing I remembered was Paul’s grandfather. It’s worth a rewatch, there’s lots of things going on that get missed.